The reconstructed Metropolitan Campus Center at Cuyahoga Community College (Tri-C®) brought rave reviews from students, faculty and staff when it opened for the start of spring semester. It also caught the attention of The Plain Dealer’s Steven Litt, who covers architecture, urban design and city planning for the newspaper. Litt showcased the building in a story appearing in the Sunday edition’s Arts & Life section. He called the vibrant new hub of student life a “dramatic” addition to a campus built half a century ago in the Brutalist style of the day. Sabrina Sayage nestled into an upholstered swivel chair at the top of the bleacher-style staircase in the newly renovated and expanded Campus Center at Cuyahoga Community College’s Metro Campus. 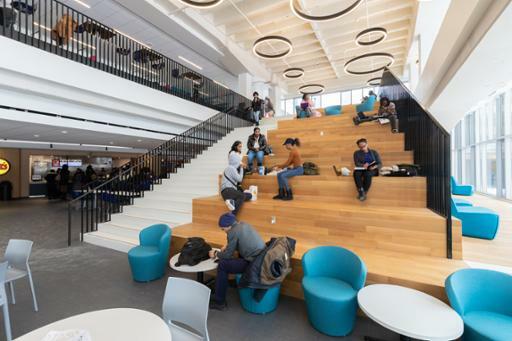 From her perch, she overlooked a two-story, glass-enclosed commons area where dozens of other students ate lunch or worked on homework at tables or in conversation nooks. As she tapped away at her laptop, she enjoyed the sensation of what design theorists call “prospect and refuge.” She felt safe but also connected to her surroundings. The 21-year-old Parma native, who is studying to be a social worker, could also peer through floor-to-ceiling windows with views of a snowy courtyard framed by other campus buildings where she’d attend morning and afternoon classes. Such words offer a powerful and well-deserved endorsement for the $40 million makeover of the Campus Center, located south of Community College Avenue at East 30th Street. To read more, click here for the online version of the story.